Airtel broadband bill payments are endless. Now Airtel bills can be paid at our convenience anywhere, anytime through easy payment methods. We can either 1. Drop-off cheques at the nearest airtel relationship center or 2. Transfer money online through debit card, credit card or net banking and so on. We don’t want to remember the due dates, as we will be notified via SMS, email as soon as the bill is generated. Let us what are the Airtel Broadband Bill Payment options available for us. We can choose a host of easy payment options for airtel broadband bill payment from the below gateways to suit our transaction needs. Online registration has to be done for initiating standard instructions. It is made paperless without form or documentation. Follow these steps to register. Step 2 - Click on the option 'Broadband'. Enter your Airtel landline number, standing instruction, email id in which you want to get the notification. Your details will be verified. 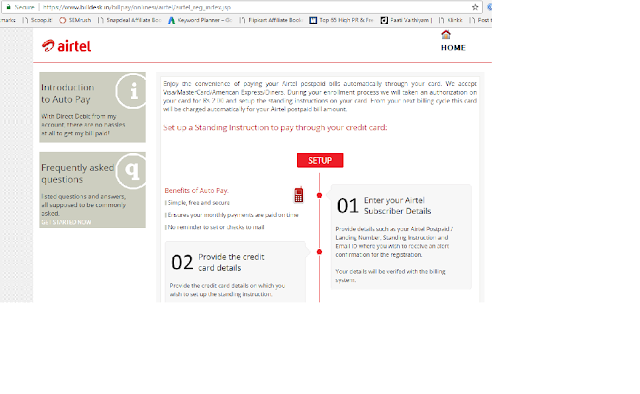 Step 3 - Key in the credit card details. You will receive an email or SMS regarding the details. It is beneficial since its registration is instantaneous and gets activated within 1 working day. This standing instruction facility can be canceled without documentation at the users discretion. National Automated clearing house is an automated debit service which debits the money from your account on the specified by the user on the due date. This service can be availed by downloading the NACH automate Auto debit mandate form and can be submitted at the nearest airtel store. This form can also be collected from airtel shops and the same can be filled and submitted. Once this duly filled form is received and verified, this service gets activated within 7 working days through NACH. 1. The user has to login using their account ID and password. 2. Then Make new payment option need to be clicked. 3. The amount to be paid needs to be entered using any valid Visa, Master card or Diners credit card and submit the same. 4. The payment will be authenticated over the gateway and the user credit card will be debited instantly. 3. The amount to be ppaidneeds to be entered and bank option need to be chosen to make your payments. 4. The payment will be authenticated over the gateway and the user debit card will be debited instantly. The user will get a transaction reference number which is an acknowledgement of the user payment transaction request. This method makes the user pay their bills via cash at their nearest cash point. System generated payment receipt will be given to the user. If the user is provided with manual receipt then ensure to accept only the receipts provided with Hologram. This method makes the user to drop the cheque at any cheque drop box that is located in your city. The users can choose any one of the payment options whichever the user finds suitable for them. The above mentioned payment options allows the user to choose from the available options and make payments at their convenient time and at their ease. Bharti Airtel limited is a leading global telecommunications company with operations in 20 countries across Asia and Africa. This company is headquartered in New Delhi. The company’s product offerings include 2G, 3G, 4G Wireless services, mobile commerce, fixed line services, high speed DSL broadband, IPTV, DTH, enterprise services. 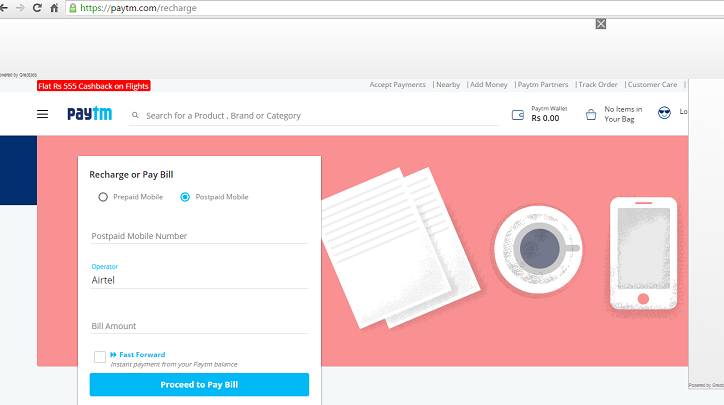 Airtel bill payment can be done through different authorized 3rd parties like Paytm. You can use the Paytm by visiting the below link. Here for Airtel bill payment postpaid mobile option should be clicked and then postpaid mobile number needs to be given. In the operator option Airtel should be selected and the bill amount should be given in the amount box to proceed for the bill payment after clicking proceed to pay bill button. The user can also check the fast forward check box to do the payment instantly that is available from the Paytm balance. Hope you find the article on Airtel Broadband Bill Payment option is useful for you to pay your Airtel Broadband bills online.